A. The candidates and offices on a particular ballot will differ depending on the county and districts in which you reside and the primary in which you’re voting (Democratic or Republican). 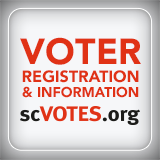 To see the candidates that will appear on your ballot, visit scVOTES.org and click “Get My Sample Ballot” in the mySCVOTES section of the homepage. 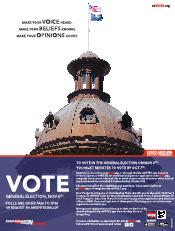 A. Polling places will be open 7:00 a.m. to 7:00 p.m. for the June 12 Primaries and the June 26 Runoffs. As long as you are in line by 7:00 p.m., you will be allowed to vote. Q. Can I vote in both primaries? A. No. State law prohibits voters from voting in more than one party’s primary on the same day. Q. If I voted in one party’s primary, can I vote in the other party’s runoff? A. No. The runoff is a continuation of the primary. If you voted in a party’s primary, you can vote only in the runoff of the same party. Q. If I didn’t vote in either primary, can I vote in a runoff? A. Yes. You have the option of voting in either party’s runoff. Q. What if I don’t have one of these Photo IDs? A. If you do not have one of these photo IDs, you can make your voting experience as fast and easy as possible by getting one before Election Day. 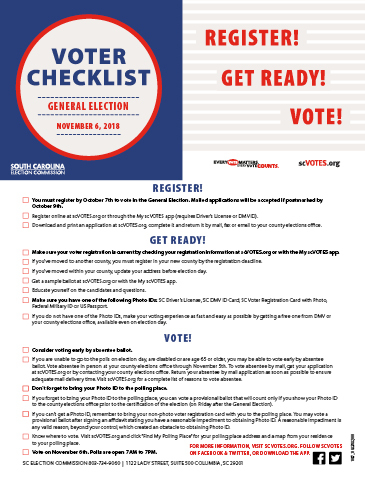 If you are already registered to vote, you can go to your county elections office, provide your date of birth and the last four digits of your Social Security Number, and have your photo taken. You can do this even on Election Day. Free DMV ID Cards are also available from the Department of Motor Vehicles. A. 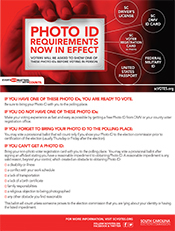 If you forget to bring your photo ID to your polling place, you may vote a provisional ballot that will count only if you show your photo ID to your county elections office prior to certification of the primary (on Thursday after the Primary). Q. I still have my absentee by mail ballot. What do I do? A. You can vote your absentee ballot and return it to your county elections office no later than 7:00 p.m. on election day. If you want to vote at your polling place, you will need to return your unvoted absentee ballot to your county elections office and receive a letter authorizing you to vote at the polls. Q. Can I return by absentee ballot to my polling place on Election Day? A. No. Poll managers cannot accept absentee ballots at polling places. Q. I’ve lost my voter registration card or my photo voter registration card. Can I still vote? A. Yes. Your voter registration card is your notification that you have registered to vote and shows your precinct and polling place. 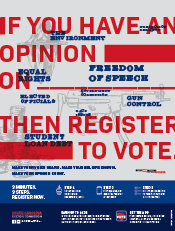 Your voter registration card is not necessary to vote. If you lost your photo voter registration card, you may also vote with your driver’s license, DMV issued ID card, federal military ID, or U.S. passport. 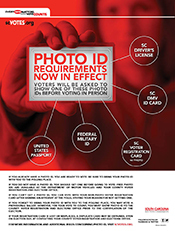 If you don’t have another Photo ID, you can get a replacement photo voter registration card from your county elections office, even on Election Day. If you can’t get a replacement before going to the polls, bring your non-photo voter registration card with you to the polling place. See answer to previous Question “What if I don’t have one of these Photo IDs?” for details. …moved to another residence within your precinct, you can update your address at your polling place and vote a regular ballot. …moved to a different precinct within your county, you are eligible vote Failsafe (see below). …moved to another residence in another county within 30 days of the primary, you are eligible to vote Failsafe (see below). …moved to another residence in another county prior to 30 days before the primary, you are not eligible to vote. You can vote at the polling place in your previous precinct using a failsafe provisional ballot. A failsafe provisional ballot contains only federal, statewide, countywide, and municipality-wide offices. You can go to the county elections office in the county in which you currently reside, change your address, and vote a full ballot there. Q. I saw a candidate/candidate’s representative at my polling place talking to voters. Can he do that? Inside the polling place: No campaigning is allowed. Candidates may be inside the polling place to observe and may casually speak to voters as long as they are not campaigning, intimidating voters, or interfering with the election process. Within 200 feet of an entrance to a polling place: Candidates and campaign staff may campaign as long as they are not intimidating voters or interfering with the election process. However, no campaign literature, signs, or posters are allowed. Candidates are allowed to wear a badge no larger than 4.25” x 4.25” featuring only the candidate’s name and office sought. Candidates must remove their badge upon entering a polling place. A. Inform the poll clerk immediately. If the issue is not resolved, contact the county elections office. A. Yes. It’s ok for any person, even a candidate, to give a voter a ride as long as it is solely to help facilitate voting. However, no one can give a voter anything of value in exchange for voting. A. A candidate must receive a majority of votes cast for that office to win the primary. In offices with one seat to fill (most offices), majority is determined by dividing the total votes cast for the office by two. Any number of votes in excess of the quotient is a majority. If no candidate has a majority, then the two candidates remaining with the highest number of votes will appear in a runoff two weeks after the date of the primary (June 26). Q. I received my Runoff absentee ballot in the mail. Why are some offices and candidates marked out? A. This is common practice and nothing to be alarmed about. Because of the short time frame between the Primary and Runoff and the time it takes for ballots to be delivered by mail, recreating and reprinting Runoff absentee ballots is not an option in most cases. Candidates that did not make the runoff, as well as offices for which the nominees have been decided, are marked through. Any votes for offices or candidates that are marked through will not be counted. Q. Can I take my child with me to vote? A. Yes. Minor children (under age 18) of a voter may accompany the voter in the voting booth. A. Yes, there are several state laws addressing political signs on roadways, as well as county and municipal ordinances. See SC Code of Laws Sections 57-25-10, 57-25-140, and 7-25-210. Ultimately, it is the responsibility of the entity that maintains the road (state, county, or municipality) to enforce applicable sign laws.